Illustrating the main message of Seth Godin’s blog post “Every successful case is a special case” or how you can present a success. When reading and analyzing Seth’s blog, I noticed that the intersection of various business types is a key message here, worth to underline by visualization. 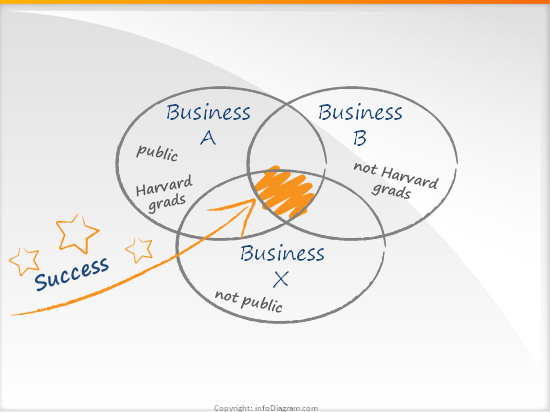 Well, good old Venn diagram is ideal for this purpose – showing an intersection. However, the result looked too heavy, too complex to read fast. So I finally selected the most simple – the same oval shapes, where the difference is expressed only in writing. Want to make the same graphics to illustrate your presentation or blog? Explore handwritten markers collection here.